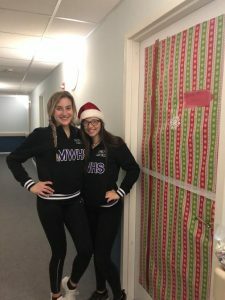 Monroe-Woodbury Varsity Cheerleaders are spreading the Holiday spirit! 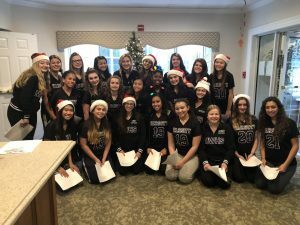 The Monroe-Woodbury Varsity Cheerleaders are spreading the Holiday spirit! 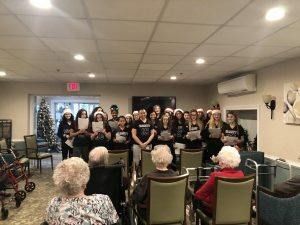 For the past six years the team has been visiting the residents of The Promenade Senior living home in Tuxedo. 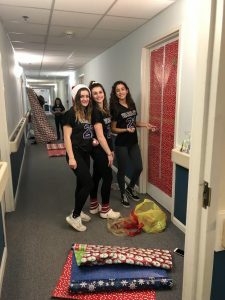 They bring wrapping paper and bows to decorate all the residents’ doors for the Holidays. The girls enjoy seeing some of the familiar faces from the year before. It’s a tradition that we all look forward to each year. After decorating they all gather and sing Christmas carols. The Holidays’ are a time for giving; a small gesture can make the world of difference for someone else. These girls share their love with the very special men and women at The Promenade. A Christmas gift for all.